The first player to move is named South (Kusini), the opponent is North (Kaskazini). The South's front row is indicated by the letter A. The South's back row is indicated by the letter B. The North's front row is indicated by the letter a. The North's back row is indicated by the letter b. 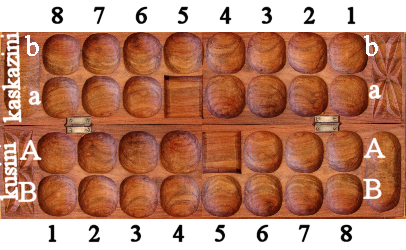 The holes on each rows are numbered from 1 to 8, starting at the left hand of the player owning the rows. South's nyumba is indicated by 'A5' and North's by 'a5'. the kimbis are: A2, A7, a2, and a7. Moves are indicated by the row (A,B,a,b) and number of the hole from which the move starts(1-8). The direction of the move is indicated by < or >. A4> the South's player takes the seeds of his pit A4 and sows them towards his right. When a player decides to play the house, a plus, '+', is added to the move. the South's player takes the seeds of his pit A3, sows them towards his right and if he reaches his 'nyumba' he will play it. a kutakatia is indicated by two asterisks, **. In kunamua stage, the row indication can be omitted. If the capturing hole is a kichwa or kimbi, the direction indication can be omitted. The direction indicator is relative to the player at move. It indicates the direction in which the hand moves after putting the first stone in 'kunamua' stage or after picking up the stones of a pit in 'mtaji' stage. So, in a capture move during kunamua stage, the direction indicates whether the left (<) or right (>) kichwa is chosen to be started from. A game transcript consists of a head containg the game information and one line for every two plies (one move). The name of South's player is written in capital letters, the North's one is written in small letters. A move starts with the move number, then a colon, a space, the move for South, a space, the move for North and a semicolon follow. South plays a 'kutakata' move from his pit A6 and sowing towards his left, while North plays his pit a5 towards his right.